Most people often find themselves messaging on-the-go, but it's dangerous to be distracted while moving. There is a lack of messaging clients that offer a peek into what is happening on the other side of your screen, so VisionMail allows just that. It uses the rear-facing camera on your device to provide a partially transparent feed of your surroundings on the other side of your device. Additionally, privacy is usually important when sending messages. No one likes people looking over their shoulder from any distance. 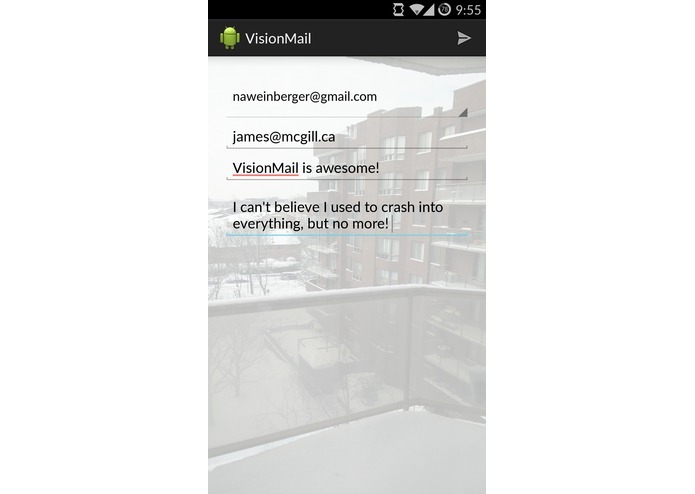 VisionMail allows you to switch to the front-facing camera to make sure that the coast is clear. If anyone does start to read over your shoulder, you'll notice them right away. VisionMail allows you to cycle between the rear camera, front camera, and no camera feed in order for you to be able to use it however you like. The idea for VisionMail is as a full-featured email client, and to get up-and-running it uses MailJet in order to send emails from any of the accounts you are signed into already on the device.